Happy New Year ya bunch of heathens! Samsung Mobile's CEO D.J. Koh has confirmed that the company's long-rumored foldable phone will actually be a tablet that will fold to the size of a smartphone. D.J. Koh said you'll be able to use the device as a tablet with multitasking capability before being able to fold it up into a more portable phone. 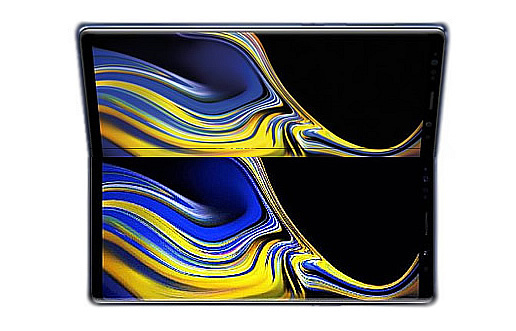 "When we deliver a foldable phone, it has to be really meaningful to our customer," Koh said in an interview at the sidelines of the Samsung Galaxy A9 launch. "If the user experience is not up to my standard, I don't want to deliver those kind of products." Koh stressed the foldable phonewill be available globally, unlike previous phones like the Galaxy Round, which used a curved display and was available only in Korea. A foldable phone would let screen sizes extend beyond 6.5 inches. "Possibly when we start selling the foldable phone, it may be a niche market, but definitely, it will expand," Koh said. "I'm positive that we do need a foldable phone." The folding capability of the device's display would mark a major advance in smartphones, since the device will actually fold and unfold without any hinge. This measn that the display should be able to withstand the fatigue caused by the folding movements. China's Huawei could be gunning to be the first to launch such a device, in November. Nice. Two 6.5" screen unfolded to get maybe 9.75" screen. beginning of this year during CES, i was wrong about doubling the screen size when it gets unfolded but its probably 1.5 times bigger instead of 2 times bigger when gets unfolded. But again, i could also be wrong about 1.5 times bigger when gets unfolded.